I’ve been a fan of roasted kale chips longer than I can remember, but it never occurred to me, until recently, to start getting more experimental in my kale usage. It is such an amazing vegetable with incredible benefits, and yet I had only prepared it a few different ways. Since it does have a similar taste to chard, I decided to cook it the same way I would make a sauteed chard recipe. Plus, I happened to have a lot of kale on hand, and I needed a quick and healthy side dish recipe that required little effort. A sauteed kale recipe was just the ticket. And I was thrilled with how it turned out — so delicious and so incredibly easy. This is definitely a great Weight Watchers recipe to go to when I need a quick side that is very low in Points and super high in nutrition. Reap the nutritional benefits of kale in this super easy sautéed kale recipe that is as tasty as it is Weight Watchers friendly. It offers a substantial side dish that is low in Points and yet still full of flavor and very filling. It’s a quick and easy recipe that compliments a variety of main dishes. Spray a large, non-stick skillet with non-fat cooking spray and set over medium high heat. Add in garlic and shallots and sauté until they just begin to become tender, about 3 minutes. Add in kale and vegetable stock, cover and lower heat to medium. Cook till kale is wilted (but not too soft) and still bright green, about 5 minutes or so. Then uncover, and toss around while the excess stock cooks off, about another minute or so. Add in lemon juice, and season with salt and red pepper flakes. Serve immediately. Are the points for these recipes updated for weight watchers point changes? I sauteed one chopped onion in 2 t of olive oil to start this out. 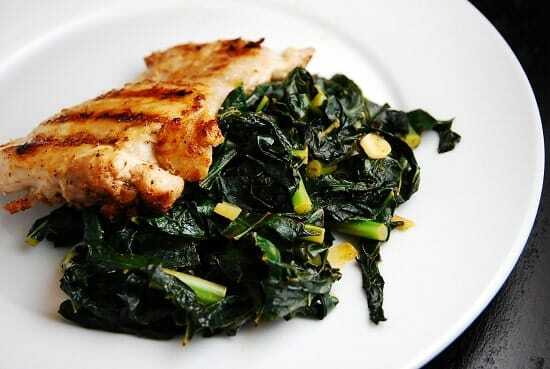 I have tried the recipe with kale and collards. My husband and I both just loved it! !